Everyone knows Smokey Bear, Woodsy Owl, and maybe even Ranger Rick Raccoon, but there are many other forest and forestry-related fictional characters that long ago fell by the wayside. Peeling Back the Bark‘s series on “Forgotten Characters from Forest History” continues with Part 16, in which we examine Tim Burr. In July 1949 the Weyerhaeuser Timber Company debuted the first issue of its new company-wide magazine. Weyerhaeuser Magazine was targeted to company employees and featured company news across the various branches, as well as features on Weyerhaeuser employees both on the job and away from work. The inaugural issue of the magazine also introduced to the world a brilliantly-named character: Mr. Tim Burr. Tim’s purpose was to promote workplace safety, similar to previously profiled characters like Herman I. Cautious and Paula Bunyan. But unlike Herman and Paula, who were committed examples of proper workplace behavior, Tim was a bit more of a daydreaming klutz. While a good-natured worker, Tim continually ran into trouble while on the job. In his first appearance, Tim falls down the stairs at work while dreaming of an upcoming vacation. In subsequent appearances he gets stuck in sawmill machinery, runs into trouble while self-administering first aid, forgets to wear a gas mask at an inopportune moment, and gets hit by a falling tree. The five-panel Tim Burr comic strips always ended with Tim either in the infirmary or covered in bandages (usually both). First two panels of first-ever Tim Burr comic. Click to view full strip. The Tim Burr comics were drawn by artist Jack Keeler, who spent much of his early career in the Pacific Northwest. Thanks to some information provided by Keeler’s grand-nephew we now know a lot more about the artist’s life and work. Keeler was born in Wyoming in 1923 but moved with his family a few years later to Everett, Washington. In the early 1940s he attended the Cornish College of the Arts in Seattle. Following service in World War II, Keeler went to work as a comic artist. His work appeared alongside icons such as Stan Lee and Jack Kirby in various 1940s comics (Keeler created characters such as Soapy Sam, Junior Genius, and the Rosebud Sisters). During the time of Tim Burr, Keeler was working for an advertising agency in Tacoma, Washington. In 1950 he moved to Los Angeles and then later to New York where he achieved great success in the advertising industry. One of the original “Mad Men,” Keeler was the creative genius behind Folgers Coffee campaigns in the 1960s, and also did work for the 1967 Chevy Camaro, Western Airlines, Heinz Ketchup, and many other brands. Like all our Forgotten Characters, though, Tim continues to live on here in the Forest History Society Library and Archives. Continue below for more classic Tim Burr comics drawn by Jack Keeler. Tim Burr comic September 1949. Click to view full strip. Tim Burr comic November 1949. Click to view full strip. Tim Burr comic January 1950. Click to view full strip. Tim Burr comic March 1950. Click to view full strip. Tim Burr comic May 1950. Click to view full strip. On this date in 1903, Bob “Forest History” Hope was born in London, England. His career in comedy spanned 60 years and moved from the Vaudeville stage to radio and film and eventually television. He appeared in more than 70 movies, most famously in the “Road” series with his pal Bing Crosby, a fellow tree enthusiast. Readers of a certain age may remember Bob’s many television specials in which he’d refer to himself in the third person and use the name of his sponsor as his middle name, as in “Hi! This is Bob ‘Texaco’ Hope…” So we thought we’d share the few items we have of Bob “Forest History” Hope with you. Bob Hope Fire Prevention ad 1948. Bob “Keep America Green” Hope takes time off from his tour through the Lake States to display this fire prevention poster, designed by American Forest Products Industries for use in schools. Bob holds the national version of the “Keep Green” reminder that was localized for the various states. Bob Hope with Keep America Green poster. Bob Hope, Zsa Zsa Gabor, and Paul Searls in 1954. On June 12, 1941, the nation’s first Tree Farm was dedicated. The 120,000-acre Clemons Tree Farm in Washington, owned by the Weyerhaeuser Timber Company, received that designation with great fanfare—Washington Governor Arthur Langlie and other dignitaries were on hand for the ceremony. From that one property in the Pacific Northwest has grown a movement that now is international in scale. As the American Tree Farm System® (ATFS) celebrates its 70th anniversary, there are more than 88,000 private landowners sustainably managing 26 million acres. Prior to 1940, most commercial-grade timber came from industry-owned lands. While fire was a concern on all forest lands, the Weyerhaeuser Company took an active interest in changing public attitude about fire prevention because of fire’s impact on the company’s holdings. Heavy use by hunters, fishermen, berry pickers, and vacationers posed a fire hazard to reforestation efforts on their tract in Grays Harbor County and elsewhere. By the summer of 1941, Weyerhaeuser had built an infrastructure of lookout towers, telephone lines, and roads to make fighting fires easier. Then to impress upon the locals the need for preventing fires, the company invited the public to tour the forest they now called a Tree Farm. It was leadership by example, something the ATFS has been doing ever since. The Weyerhaeuser company came up with the term “tree farm” because, it was argued, “everyone knew that a farm was for growing repeated crops of agricultural products” and what they were doing was growing repeated tree crops. The plan for unveiling the Tree Farm concept included naming the farm for an area figure—pioneer logger Charles H. Clemons—and holding a public dedication ceremony. About 500 people packed the Montesano Theatre for the ceremonies. In his address, Governor Langlie told the throng, “The Clemons Tree Farm may form the experimental basis that may mean a great deal to the entire state. It may set the pace for millions of acres of such lands throughout the state.” Little did he know that it would set the pace for millions of acres throughout the nation as the American Tree Farm System. You can learn more about the history of the ATFS from this 70th anniversary article in the organization’s magazine, Tree Farmer. This 1949 article from Agricultural History provides an excellent examination of the founding and early struggles of the organization. And you can learn more about our archival holdings and follow a link to historical photos of the ATFS from this blog post by FHS archivist intern Shaun Trujillo. In June of 1951, another crowd gathered in in Montesano, Washington, to celebrate the tenth anniversary of the Clemons Tree Farm. A plaque was unveiled commemorating the 1941 founding, and in attendance were William B. Greeley, Wilson Compton, J.P. Weyerhaeuser Jr., and Mrs. Charles H. Clemons. At the time of the ceremony, over 4 million Douglas-fir seedlings had been planted on Clemons Tree Farm land. By the end of the tenth anniversary year, the American Tree Farm System had already spread to 33 states. From left: Wilson Compton, Mrs. Clemons, J.P. Weyerhaeuser Jr., and W.B. Greeley commemorate the 10th anniversary of Clemons Tree Farm. By the time of the 25th anniversary in 1966, every state other than Alaska and Hawaii had officially joined the American Tree Farm System. Promotional “Silver Anniversary Dollars” were produced to commemorate the occasion. Tree Farm Silver Anniversary Dollar. The 40th anniversary of the American Tree Farm System was held in North Carolina on June 12, 1981. Participating in the festivities was actor and celebrity tree farmer Andy Griffith. Every state now featured a tree farm, with Alaska and Hawaii having joined the ATFS in 1974 and 1975, respectively. By the end of 1981, more than 40,000 tree farms managed a total land area exceeding 80 million acres. From left: North Carolina Governor Jim Hunt, George H. Weyerhaeuser, Andy Griffith, and T.O. Perry at ATFS 40th anniversary. The Tree Farm System began the 1990s with more than 70,000 tree farmers managing some 93 million acres. The 50th anniversary in 1991 (“50 Years of Growing Trees . 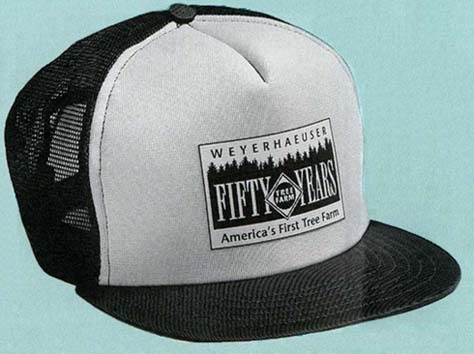 . . And More Than Trees”) featured a new round of commemorative promotional items, such as trucker hats. The 60th anniversary also marked a full 25 years of the Outstanding Tree Farmer Award. This award, begun in 1976, honored tree farmers who have shown an outstanding commitment to sustainable forest management. Simple signs like this marked the entrances to the first tree farm. Today the familiar green and white diamond logo identify properties in the American Tree Farm System and their purpose: sustainable management of forests for wood, water, recreation, and wildlife. In the first decade of the twenty-first century, AFTS decided to focus exclusively on family forest owners—who, notably, own more forest land in America than industry owners. New certification standards focus on the needs of woodland owners managing smaller woodlands. ATFS now provides tools and on-the-ground support to 88,000 family forest owners sustainably managing 26 million acres. The program is still going strong as it moves towards its eighth decade. In August, the 2011 Tree Farmer Convention will take place in Albuquerque, New Mexico. FHS Historian Jamie Lewis and Archivist Eben Lehman will be on hand to make a presentation about the history of ATFS and the ATFS records housed by the Forest History Society and to exhibit our publications. 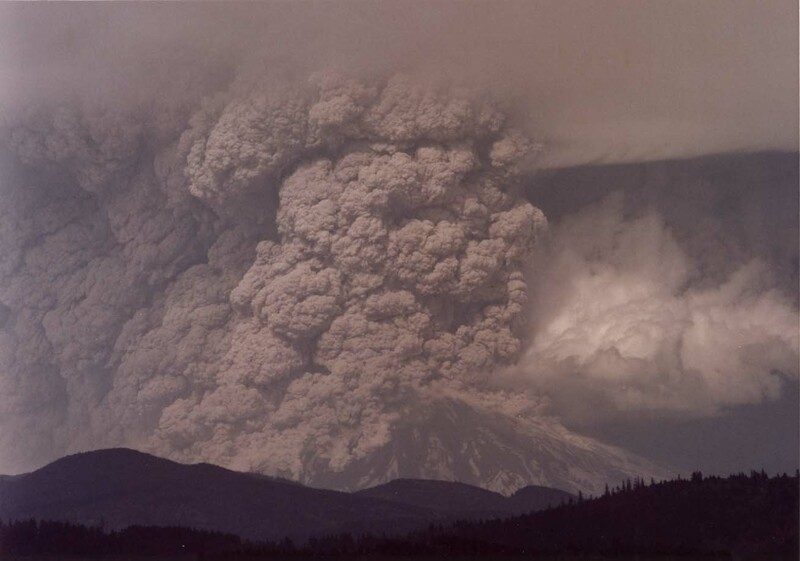 Thirty years ago today, Mount St. Helens erupted in Washington on the Gifford Pinchot National Forest and left an altered landscape as well as a mess of historical documents in its wake. The deadliest volcanic event in U.S. history flattened 200 square miles of forest on the surrounding private and public lands. Its impact on forest management is still reverberating across the pages of history and forestry textbooks to this day. FHS has a plethora of documents and historical photos of the still-active volcano in different parts of our archive and library. In addition to numerous journals and magazines in our library with articles on the topic, the federal government (in particular the Forest Service) generated documents and reports on what happened before, during, and after the event. We also have coverage of the ensuing debate over what it should do with its share of the land — whether the timber should be salvaged and the forest replanted or if it should be left alone and studied. Many of these items, along with oral history interviews with agency personnel, can be found in our U.S. Forest Service History Collection, which is searchable through our database. After much debate, which can be followed via our documents, the area became a natural laboratory and a 110,000-acre national monument with two visitors centers (we even have information on those!). Don’t want to read through all of that stuff? You can learn more about the impact of the eruption on the Forest Service’s land management practices in the film “The Greatest Good” and from a DVD extra, as well as the companion book The Forest Service and The Greatest Good. 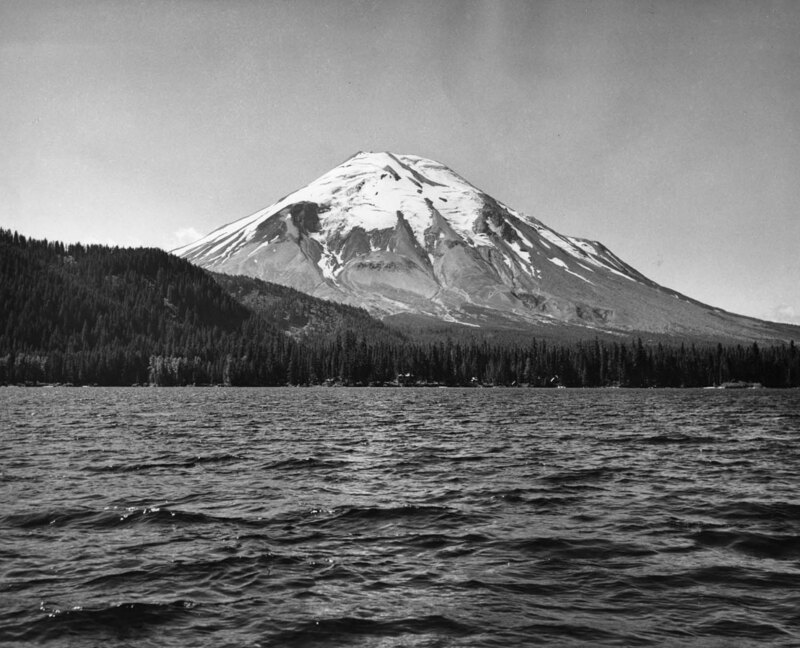 We also have several photos in the FHS collection like the one seen here of Mount St. Helens before it exploded. 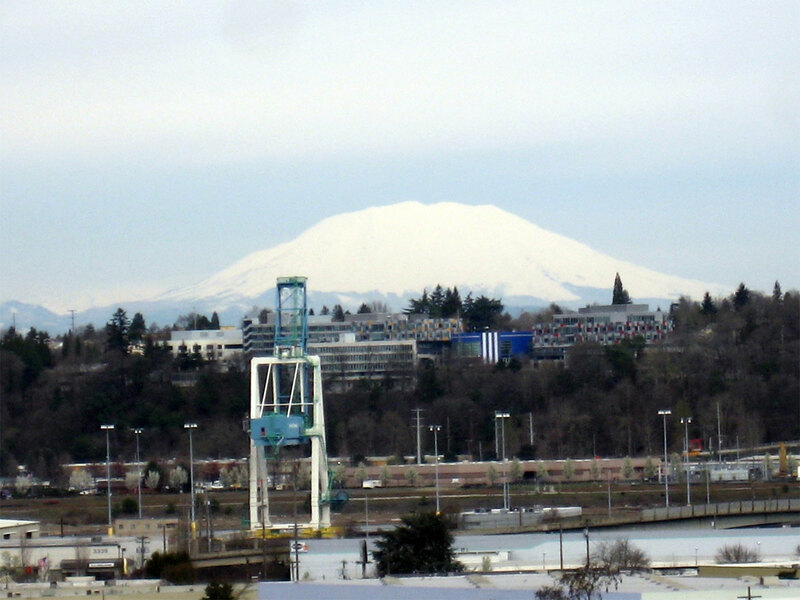 The Weyerhaeuser Company, which owned quite a bit of land adjacent to the volcano also affected by the eruption, had to make similar decisions about what to do with its timberland. You can find two articles that touch on the company’s response to the eruption here and here, with “before” and “after” photos on page 26 of the second article. In light of current debates about whether the Forest Service land under study should be turned over to the National Park Service and reopened for recreation, it may be useful to revisit the history of Mount St. Helens and the legacy of the eruption thirty years ago today.